Bali Souvenior Shop A new shopping center located in Seminyak opened in 2009. This new shopping center provides free parking for motorbikes and cars. At this chic and modern shopping complex, you can find popular boutiques such as Body & Soul, café and various shops including an excellent Periplus bookstore. 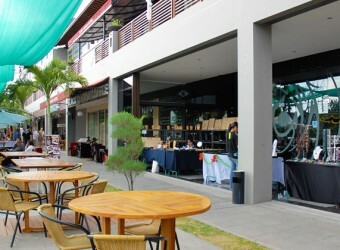 On Sunday you can find Sunday Market that takes place at the Seminyak Square area. I Wanted to Go There…. I wanted to try to go there. Seminyak Square!! I went there in the morning and many shops were still closed. I relaxed at a café. My recommended café is Bali Bakery! Not only foreigners, this café is also popular among local people….